You’d think a port town would be more into fish than meat, but Gainsborough is a port with a difference. At 55 miles from the North Sea it’s the most inland port town in Britain, as at one time it was used for trade downstream to Hull. Because it’s a land-locked port, here at Hog Roast Gainsborough we think it’s a fantastic place to cook. The people here love their meat, and we love to cook it for them. Our hog roast sandwiches are always popular, with tender pork carved into soft white rolls, accompanied by crunchy crackling, sweet apple sauce, and savoury stuffing. It really is a sandwich of contrasts. We love to cook for market towns too, the people in them always appreciate good food cooked well. Gainsborough has had a market since being granted one by King John in 1204. Markets almost always have a focus on decent local food, and at Hog Roast Gainsborough we focus on a local service. It doesn’t matter if it’s meat, fruit and vegetables, cheese, or chutney, food is always best when it’s fresh, and that’s one reason why our locally sourced roasts are such a hit. That and the fact that roasting is a slow method of cooking, which allows the meat to baste in its own juices for around six hours. This makes it especially succulent and tender, and because no extra fat is added it’s healthy too. Pub roasts are always a favourite, and Hog Roast Gainsborough is no exception. A spit roast is a great communal meal, as gathering around to watch our chef carve a whole pig brings people together to admire the spectacle. There’s something in sharing food that a buffet just doesn’t have. 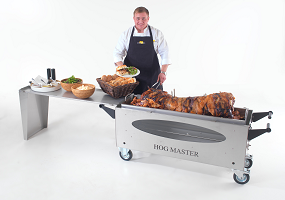 Because of this a hog roast is a good partner for football matches – people get together over the sport and the food. And since beer is a perfect accompaniment to roasted meat, a pub could be argued to be the best venue for it! We don’t just cater for pubs, though. Gainsborough offers plenty of other opportunities, from garden parties to weddings. Our machines are lightweight and manoeuvrable, meaning we can take them almost anywhere. Grass or gravel, indoors or out, we can cater for any event, and for outdoor events we’ll even bring a gazebo to keep the food safe from the weather. Because we want our roasts to be accessible to everyone, we don’t only offer pork. Lamb, beef, chicken, and turkey are also available choices – perfect for a Christmas dinner, or a kosher or halal celebration. We always work with our customers to meet their requirements, whether they want an informal barbecue with paper plates or a formal dinner with proper crockery and silverware. Our staff will also discretely clear away their rubbish when they’re done. We’ll even provide just the machine and training, if you want to make it a private affair. We love to cook, and we love happy customers. At Taste the Cracklin’s Hog Roast in Gainsborough, we get plenty of both.